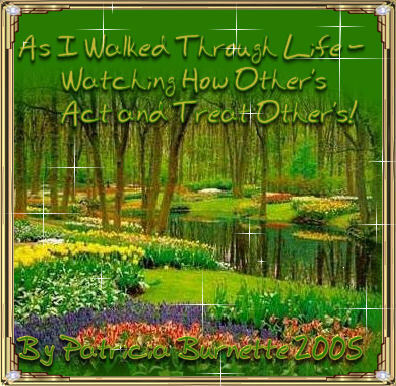 "As I Walked Through Life -Watching How Other's Act and Treat Other's"
Welcome to "As I Walked Through Life -Watching How Other's Act and Treat Other's"
I've learned- to always be thankful for everything that is given to you, no matter if it's good or bad, when we are thankful, other's learn to be thankful to. I've learned- that complaining doesn't fix things it makes them worse, be grateful for all you have because you just may end up with nothing. I've learned- that when you say , you can't you can because God gives us the will power to know we can, so stop saying you can't when you really can. Can't can't do nothing until they try. I've learned- that you can do something in an instant that will give you heartache for life and it sticks with you. I've learned- that when you always think you are better than anyone else, you shrink in your personality. I've learned- that it's taking me a long time to become the person I truly want to be. I've learned- that you should always leave loved ones with loving words and treat them with all due respect. It may be the last time you see them. I've learned- When you sow, you will also reap what you do and how you act, it will come back on you. I've learned- that if you put the past behind you, you can see the future. If you don't put the past behind you, you will always be living in the past and never overcome it. I've learned- that you can keep going long after you can't and with God You can do anything through Him. I've learned- that we are responsible for what we do, and all that we say, remember words can kill so be always kind to one another, no matter how you feel. I've learned- that either you control your attitude or it controls you and you end up saying something you will regret and be judged for it on Judgment Day. I've learned- that regardless of how a friend in a relationship is at first, the friend always and never has time for you, but you have a friend in Jesus all the time 24 hrs a day it never fades away. I've learned- that money is a lousy way of keeping score and you do not give to God don't expect Him to give to you the blessings he wants so much for you to have you will always go lacking. I've learned- that when you pray and never doubt - prayers are answered and they are delivered. I've learned- that my best friend Jesus is always there when no one else is or tries to be, I can count on Him 24 hrs a day 7 days a week. I've learned- that sometimes people kick you when you're down ,but Jesus will be the one to help you get back up. I've learned- that sometimes when you are angry you feel like you have the right , but that doesn't give you the right to be cruel. When you are you are being cruel to Jesus! I've learned- that true friendship continues to grow, even over the longest distance. And, when they don't have time for you always remember Jesus always does! it's acting your age and being the best of what you can be and use the advice your parents gave you. I've learned- that your family won't always be there for you. But that does not mean they do not love you, there are times we have to learn to do things on our own that is what makes us strong and Jesus can help! I've learned- that no matter how good a friend is, they're going to hurt you every once in a while and you must forgive them for that. As Jesus forgives you for the things you do and say! I've learned- that it isn't always enough to be forgiven by others, but you must forgive them as well, and you have to learn to forgive yourself. I've learned- that our background and circumstances you have influenced who you are, but we are responsible for who we become. Through Jesus we can become anything and do anything! I've learned- that we don't have to change friends if we understand that friends change. We always have a Friend In Jesus....he never changes! I've learned- that you shouldn't be so eager to find out a secret, It could change your life forever. Jesus knows and sees everything, so it's not a secret. I've learned- that your life can be changed in a matter of minutes, so do the best you can do and be all you can be. I've learned- that even when you think you have no more to give, when a friend cries out to you, you will find the strength to help. You help someone you help Jesus to. I've learned- that if you treat other's the way you want to be treated, then you will get treated the same way. I've learned- that credentials on the wall do not make you a decent human being. You have to work hard at it to become what God wanted you to become are you listening? I've learned- that the people you care about most in life are taken from you too soon. So watch out be careful of what you say and how you say them, and watch your actions, because you may not be able to tell them "you are sorry." I've learned- that most importantly to always love and care for and respect your parents as you only have one set and to always trust in the Lord Jesus Christ, for He is the Ultimate Father God, who Loves me and you!